Birthday Balloons – Orlando Florida and your job is to plan events such as, weddings, birthdays, or even corporates events, balloon decor is essential and to find the right party supplier could be a hassle. Depending on the events you are hosting, choosing the party theme is the next step. You can choose something fun like “Mardi Gras” for weddings, “candyland” for birthdays (kids) and a 50, 60 or 70’s theme for corporates events for example. 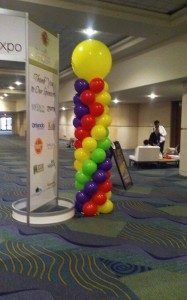 You can also keep it simple for your events, and choose either one toned colored balloons or multi colored ones. You have the option between latex or mylar and helium or non-helium. Whatever you choose, your event will be a success. Balloon décor is our biggest seller. It’s the foundation and backbone of our company everyone in our staff excels at balloon décor. Transform your event into an unforgettable experience with customized balloon décor designed to match your color scheme and theme. Whether you are planning an elegant affair or a fantastically fun party, Pooof Productions will bring your vision to life. Our mission is to create a mind blowing, entertaining experience for all ages. Our balloon twisters are personable and immersive providing hours of laughter and a life time of memories for everyone around. We strive for creativity and innovation. Ensuring your next event party is unforgettable with our balloons the sky limit!